Dr. Jasmine Zapata, MD, MPH is a dynamic author, physician, entrepreneur and motivational speaker with the mission to heal, uplift and inspire. A main focus for Dr. Jasmine is preventive medicine which involves looking at upstream factors and social determinants of health outcomes. Interestingly, one of the biggest social determinants of health outcomes is economic stability and for this reason Dr. Jasmine got involved in real estate in 2013 as a means to achieve personal financial freedom and help others do the same. She has experience with both residential and vacation rental property and also has experience with low to no money down techniques to get started in the field of real estate. Her unique strategy for investing in real estate currently allows her get paid to live in her own home! Overall, Dr. Jasmine is passionate about creating multiple streams of income for herself as well as teaching others how to do the same. Breaking the chains of poverty is a mission Dr. Jasmine is determined to win! She is determined to get OUTSIDE of the clinic walls to make a change. In her continued effort to combat poverty, she has teamed up with group of entrepreneurs from around the country and even abroad to write the highly anticipated book "Multiple Streams of Income" to inspire and empower others about different avenues to become entrepreneurs and reach financial freedom! 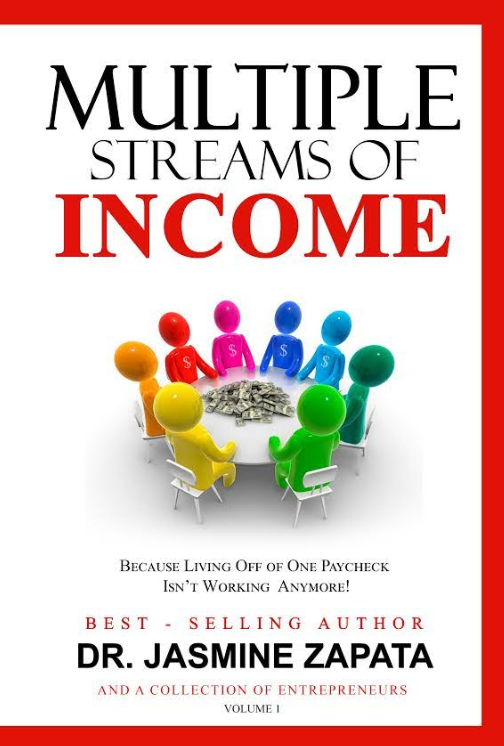 This book is an easy to read INTRODUCTION to different ways you can add multiple streams of income to your life. 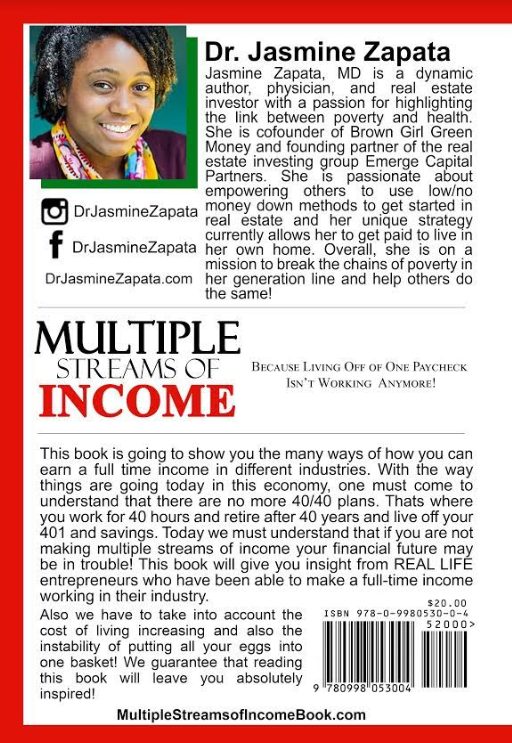 This is Dr. Jasmine's custom cover version of the highly anticipated book "Multiple Streams of Income" Edition 1. Other contributing authors include a variety of entrepreneurs from various fields including Taurea Avant (Public Speaking, Lee Chapman (Precious Metal Industry), Cissy Agurs (Cleaning Industry), Troy Conway (Music Industry), Rebecca Powell (Food Services) , Denean Ambersley (Property Management) , Elishea Moore (Health and Wellness), Tiffany Moneak-Howard (Beauty Industry), Danella Burnett (Event Planning), Diana Perez (Insurance Industry), and Aurea McGarry (Home Based Business). The wealth of knowledge in this book is tremendous! Poverty is the root cause of so many issues in our society and the purpose of this book is to inspire both teens and adults to break the generational curse of poverty and become entrepreneurs. In Dr. Jasmine's segment she discusses the link between poverty and poor health outcomes as well as why striving for financial freedom is so important. Via an easy to read Q/A format this book inspires and teaches others creative ways to become an entrepreneur and create multiple streams of income in their own lives.